Today, I took the girls to our local library's storytime like I do every Tuesday. They enjoy the elevator ride up to the top of the library where all the children's books are stored. They love snuggling next to one another on worn carpet squares as stories about frogs and princesses and super heroes drift around them. They get a kick out of checking out their own books with their very own library cards. 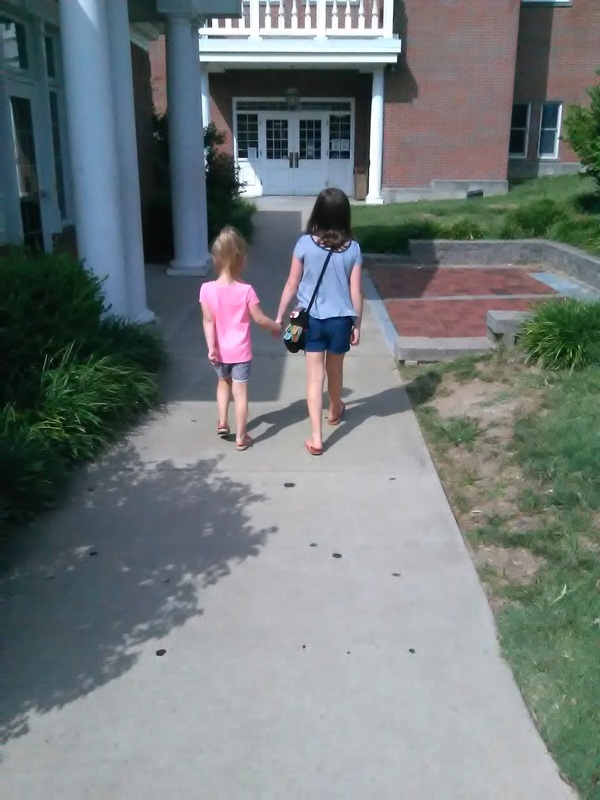 "We are like big girls, mommy," C tells me each time she reaches her hand into the pocket of my purse to retrieve her library card. In the middle of storytime, C had a meltdown. It started with tears. I swooped her up into my lap, doing my best to comfort her. Screaming soon followed. The eyes in the room shifted from the librarian to us. I knew that was our cue to exit. I carried C to the elevator doors to remove her from what was bothering her and hopefully calm her. As I reached for the elevator button, she started hitting me and managed to slip out of my hands. She ran to a bookshelf -- still screaming and threw herself on the floor. That's when I saw you. Seated on the couch near the elevator, you looked up from your book, and your gaze met mine for a moment. If you've ever tried to lift a child with low muscle tone from the floor while in the middle of a meltdown, you know it is next to impossible. So, you saw me kneel down next to my daughter. For a few moments she was inconsolable. I even asked her if I needed to call her therapist to talk to her, because I was lost and all alone. You watched me calm her to the best of my ability, and once she was calmer, you saw me sternly tell her to stand up. "You have two choices," I said. "If you feel better we can go back to storytime or we can go to the lobby, but you can't scream and ruin storytime for everyone else." She pointed that she wanted to return to storytime, and she calmly did just that. But, I saw you as we walked back to our seats. I saw the look you gave me, and it made my insides crawl and tears well up in my eyes. I tried my best to brush it off as the girls and I made our crafts and looked at books. I had almost completely forgotten about you until we ran into you again as we were stepping into the elevator. We were all in good spirits; I smiled at you as you left the elevator that we were walking into. You didn't smile back. In fact, before the elevator doors closed, you actually turned around, faced me and stared again. Your stare broke me. And as the elevator doors closed on your stare, I felt doubt sink in. Maybe I didn't say the right thing to my kiddo. Maybe I should have been more comforting. Maybe I should have been more stern. Maybe I'm a terrible mom. Maybe we shouldn't have even stepped foot in the library at all today. Hindsight is 20/20, right?! I did my best to hide my tears from my kids. As I drove home, I kept trying to unearth the meaning of your stare. It unnerved me. It made me question myself. It felt judgy. But I like to believe people are good. That no one would condescendingly stare at a mom who was obviously trying to do her best or judge her if her best wasn't good enough. Instead of staring in judgement, I like to believe that when you first saw me carrying my child to the elevator door, you were thinking, "I've been there. I've done that. I know how this feels. You're doing good, mom." And when you watched my daughter melt into a puddle on the floor, I like to think you said to yourself, "I wish I still had a little one to sit next to on the floor and comfort and wipe away tears. You're doing good, mom." While you stared on as I helped my daughter stand back up, make her choices, and rejoin the group, maybe you thought, "Setting boundaries isn't easy, and going back to a problem to fix it isn't for the feint of heart. You are both brave. You're doing good, mom." And maybe none of these things were the reason behind your stare. In reality, maybe you were just judging me. But, I'd like to think that as we met at the elevator, you looked at us to say, "Today may not have been perfect. That's okay. You don't have to be perfect. That's okay too. And your kid doesn't have to be perfect either. That's even more okay. You're doing good, mom." And as those elevator doors closed and you turned around for one last look, I hope it was to wish us well, "Motherhood isn't easy. You will stumble, and you will fall. Just keep trying. Always keep loving. That's all that matters. You're doing good, mom."